Martial arts program aimed specifically at French Jews to train them, mentally and physically, to fight frequent attacks. Anti-Semitism in France has skyrocketed over the past several months, with the Service for the Protection of the Jewish community of France (SPCJ) reporting in September that there was a 91% increase in hate crimes against Jews in the first half of 2014. 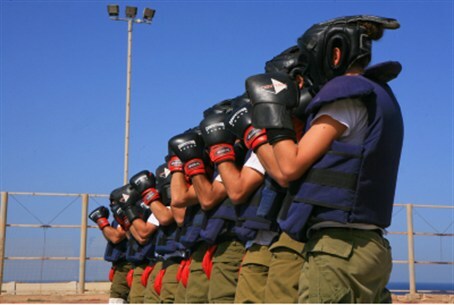 But dozens of French youth have decided to take a stand over the past week, and in a unique way - by joining a special program in Israel to train them in the martial arts of Krav Maga, or self-defense. The program, titled "Magen," was initiated in cooperation with the World Betar Jewish Agency. The workshop was launched on Sunday morning at the Wingate Institute in Netanya and is specifically targeted toward French Jewish teenagers. The program trains the teens in developing physical and mental strength to deal with anti-Semitic violence they experience routinely in their daily lives in France. The program will combine practice sessions during their stay in the country, so that young people will learn the art, as well as heritage studies based on the principles of Zionism, and visits to national heritage sites and communities in Judea and Samaria. Young people participating in the program will return to their communities in France and will use the knowledge learned to protect synagogues and Jewish communities, the program's organizers stated. Moreover, the program will encourage those young teens to immigrate to Israel, and help them find employment and integrate in the event they do decide to make Aliyah. At a special ceremony held last Thursday in the presence of the heads of the World Zionist Organization and the World Betar Movement, Mr. Neria Mayer, CEO of Betar, lauded the revolutionary program. "The program is most appropriate Zionist response to anti-Semitism currently taking place in France," he said. "[Ze'ev] Jabotinsky's vision for the establishment of a Jewish defense force exists even today, with the establishment of the first program of its kind that combines the values ​​of Betar, national defense and Jewish pride. " Yaakov Hagoel, Head of the Department for Combating Antisemitism World Zionist Organization, added that "anti-Semitism in Europe is gradually increasing each year. The program was established to respond to the wave of anti-Semitic attacks in France. Nevertheless, we should not forget that the best solution is immigration to Israel." The French office of the Jewish Agency for Israel revealed in September that France was leading the world in aliyah (immigration) to Israel, the first time it has held that position. In reporting the figures the Jewish Agency cited a "climate of anti-Semitism that is losing its taboo," and added "in the Western or free world, we've never seen one percent of the Jewish community emigrating to Israel." Indeed, a full 1% of France's 500,000-600,000 Jews are on pace to make aliyah in 2014. France's Jewish population is the third largest in the world after Israel and the United States. France is also home to Europe's largest Muslim community, assessed at roughly five million, which has been a large source of the anti-Semitic violence in that country. The attacks in France include the murders of a rabbi and three Jewish children by an Al-Qaeda inspired gunman Mohammed Merah in 2012 in the southern city of Toulouse.